• PLOT SUMMARY: "Nightmare Scenario!" - Be Superior! How much would you pay for perfection? Beauty? Immortality? Tony Stark knows, and he's ready to give it to you in SUPERIOR IRON MAN #1! But at a terrible price. 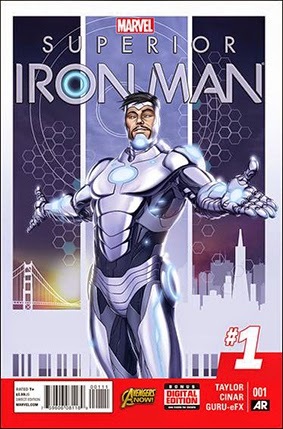 Spinning out of Avengers & X-Men: AXIS, the old Tony Stark is back, only this time he's SUPERIOR! More stylish, more confident, and more cunning than ever before. And he's ready to lead you into the future! San Francisco is about to become the prototype for his new world concept. The first step? Release Extremis upon the entire city! Only Daredevil isn't down with Stark's new vision of the future. Does the Man Without Fear have a place in the city of tomorrow? A bold new direction for the Armored Avenger begins this November from the all-new creative team of Tom Taylor (Injustice: Gods Among Us, Earth 2) and Yildray Cinar (Supergirl)! BE SUPERIOR! NEW CREATIVE TEAM TOM (INJUSTICE: GODS AMONG US/EARTH 2) Taylor AND YILDIRAY (SUPERGIRL) ÇINAR START AN ALL-NEW SERIES SPINNING OUT OF AXIS! How much would you pay for perfection, beauty…immortality? TONY STARK is going to find out. The AXIS EFFECT has changed IRON MAN. Now HE'S going to change the WORLD…at a terrible cost. She-Hulk and Daredevil cameo. Written by Tom Taylor. Art by Yildiray Cinar. Cover by Mike Choi.